THATCampX organizers include, l-r, Meghan Landry, Wendy Kraglund-Gauthier, Laura Estill, Katie Aubrecht and Matea Drljepan. Missing from the photo is Margaret Vail. THATCamps take place around the world, but this is the first one in Antigonish, says organizer, StFX English professor and Tier 2 Canada Research Chair in Digital Humanities Dr. Laura Estill. THATCamp stands for “The Humanities and Technology Camp,” and it is an unconference: an open, inexpensive meeting where humanists and technologists of all skill levels learn and build together in sessions proposed on the spot, she says. 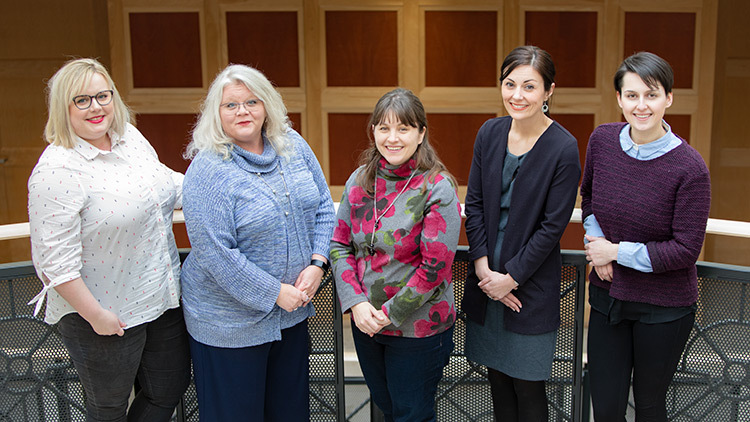 “As a new CRC, I proposed to offer digital humanities training in Atlantic Canada,” says Dr. Estill, who organized this event with Meghan Landry, Wendy Kraglund-Gauthier, Katie Aubrecht, Matea Drljepan, and Margaret Vail. “THATCampX is a gathering to make connections, start discussions, and reflect on our current digital practices and pedagogies. THATCampX is also the first step towards thinking about future digital humanities training events,” she says. THATCampX is also the first step towards thinking about future digital humanities training events. She says she also hopes to launch the Digital Humanities Summer Institute-East (DHSI-East) as part of the international DHSI.org training network based at the University of Victoria. She says she also hopes outcomes will help map, as a community, the kinds of future initiatives of interest, and that a highlight of the event was showcasing our regionally-based expertise by brainstorming future courses we could teach. Dr. Estill says 31 people attended the event, with participants from StFX, Acadia University, Mount Saint Vincent University, Cape Breton University, the Canadian Association of Research Libraries, Dalhousie University, Université de Montréal, and ACENET-Compute Canada. Participants included graduate students, professors, librarians, curriculum support advisors, and the range of fields included the humanities, such as English, history, and women’s studies; the social sciences, including psychology; computer science, and library science.